I’ve just been watching that hot new group The Pet Shop Boys perform their single, ‘It’s A Sin’, on Top of the Pops. They are skull-explodingly pretentious, especially the singer in his floor-length Edwardian motorist’s coat. I haven’t seen such misty-eyed narcissism directed at a TV camera since Mrs Thatcher’s last party election broadcast. This record they’ve taken to number one is the most astounding piece of deja entendu. As far as my ear can detect, its main riff is almost note-for-note the Cat Stevens song ‘Wild World’. The only significant change of pace occurs when it suddenly takes to sounding like Procol Harum’s ‘Conquistador’. Don’t think I’m suggesting for one second that The Pet Shop Boys have deliberately ripped off one of the better-known pop singles this past 20 years. I’m quite sure that, adrift on their clouds of ego and electronic artifice, they simply never realised. 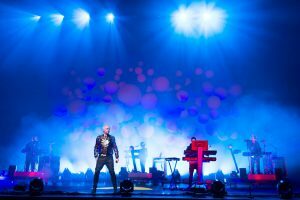 At least one can say the name Pet Shop Boys now assumes some meaning, since I can’t think that the record-buying public has ever been sold a bigger pup. That any tune at all can be found in a Top 10 hit is, of course, pretty remarkable. Computers no longer merely record and provide backing to pop songs; they also now seem to write them. Whether the session be for Pepsi and Shirlie or Mel and Kim, for Five Star, Atlantic Star or Starship, the same couple of hackneyed chords and robot phrases apparently emerge from the central cliche-bank. The present British charts are about as exalting as a chorus of Amstrads. Our eyes have been palsied by what one might call the Chariots of Fire syndrome. Current taste is for what that movie, scarcely less than Lloyd Webber, invented  huge empty meringues of sound, thunderous with symphonic insinuation that Britain is Great again and all’s well in the Thatcher millennium. During Wimbledon fortnight BBC-TV used just such as heroic theme to usher in the heroism on the courts. One took it at first for an undiscovered Planet by Holst. Closer listening revealed it to be a ludicrously Lloyd Webberised version of The Beatles’ ‘Get Back’. In the mid-70s, punk rock blew some realism through a music scene one had supposed could not become more atrophied by sloth and megalomania. Those were days when a rock band’s performance contract would stipulate their backstage refreshments must include 1805 Napoleon brandy. If by some ill chance only 1806 Napoleon brandy could be provided, the brand would refuse to go on stage. Ten years after the punk revolution, what do we find? Musical illiterates still talking to cringing DJs about their singles and albums like Shakespeare folios, and ‘going into the studio’ as if at work on War and Peace. Witless hype, the earth moving force it ever was  from Frankie Goes To Hollywood through Sigue Sigue Sputnik to the Beastie Boys. Along with all the waves of new teenage poseurs, many of the same old sweats carry on churning it out. Can it really be that the late Eighties’ biggest male vocal sound is Phil Collins, still singing in the English grammar school Blues voice of 1969? If that weren’t bad enough, Genesis also are still around, metamorphosed from Glam Rock tinsel to turquoise and candy-pink incarnations of Next. Black music, pop’s great dynamo, is blander and more boring even than in the awful days of Barry White  parroted by girls like Whitney Houston or ghetto-blasted by all those indistinguishable fat bores in shades and leather hats. Like the man said, do you spell Rap with a big or small c? For me, the most gruesome recent trend has been pop stars turning into social climbers, jockeying to sit beside Princess Diana at charity galas and, perhaps, murmur some Geldofish pleasantry into her uncritical ear. Naturally, there are exceptions  bands with too much humour to be pretentious, like Level 42, or too much sheer talent, like Fine Young Cannibals and Simply Red. A healthy antidote exists in the number of young bands falling back on blues and jazz idioms, even standard show tunes, rather than accepting the dross the computer-songsmiths dish out. Simply Red’s Mick Hucknall does a version of ‘Every Time We Say Goodbye’ that can stand comparison with Ella Fitzgerald’s. Why is there no new Cole Porter writing for a voice like that? I won’t go on about the Sixties, an era I concede to be grossly overrated in nearly every way. But in the Sixties there was one thing you did know. Every day of the week, someone somewhere was writing a song you knew you’d never heard before. Take it from me, it was a terrific feeling.